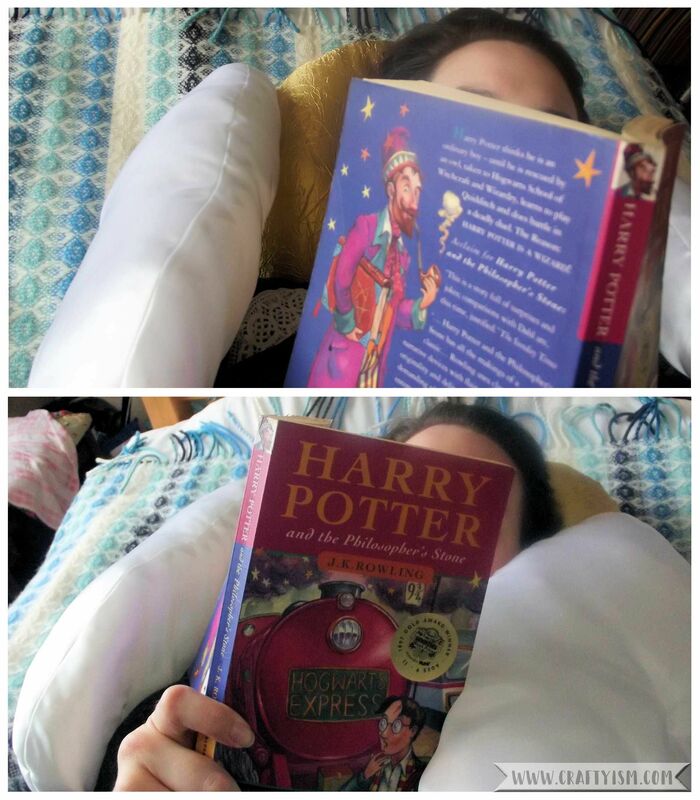 When you are re-reading Harry Potter and the Philosopher’s Stone, you’re going to need something to rest your head on. How about making this Golden Snitch Cuddle Pillow? Lean back on its plump golden body and wrap its squishy wings around your shoulders! 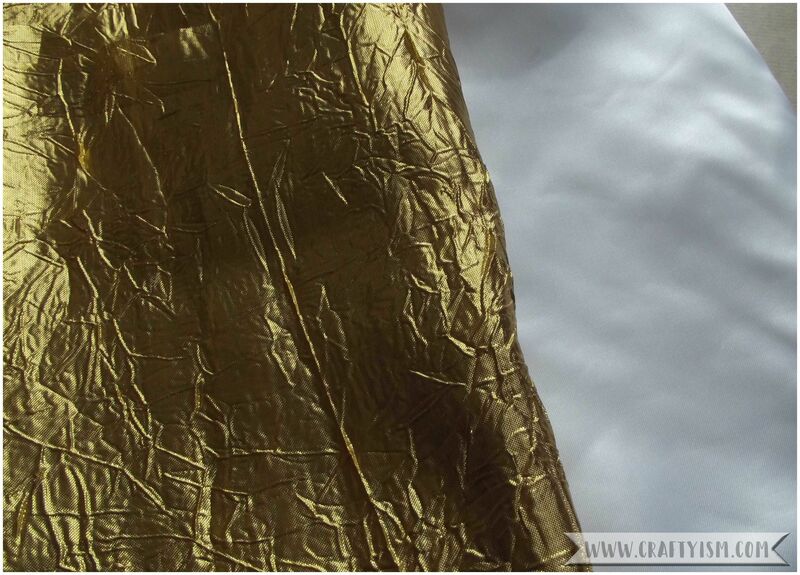 For this tutorial you will need some gold and white fabric. 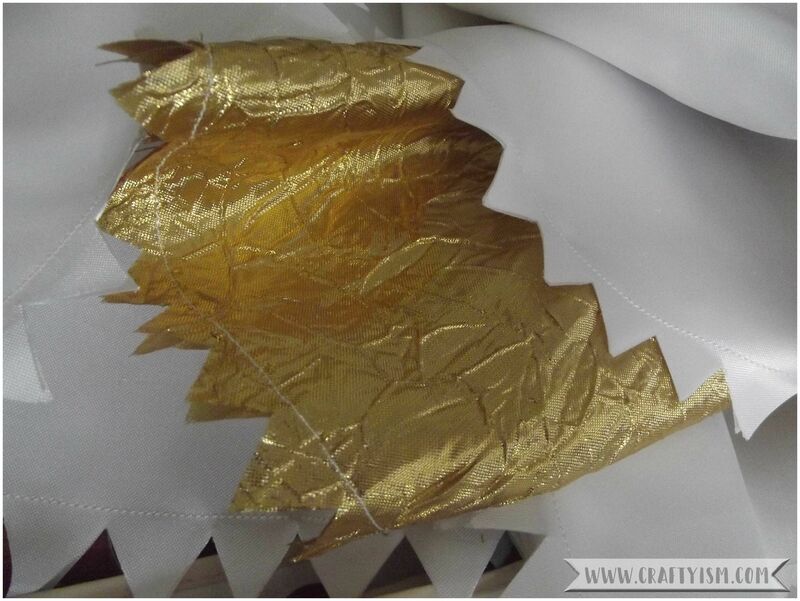 I found this really fun crinkly gold and some satin type fabric in my local fabric shop and bought half a meter of the gold and a meter of the white which came to about £3.50. There aren’t any specific sizes in this tutorial, because really, you can make this pillow as big as your fabric allows. 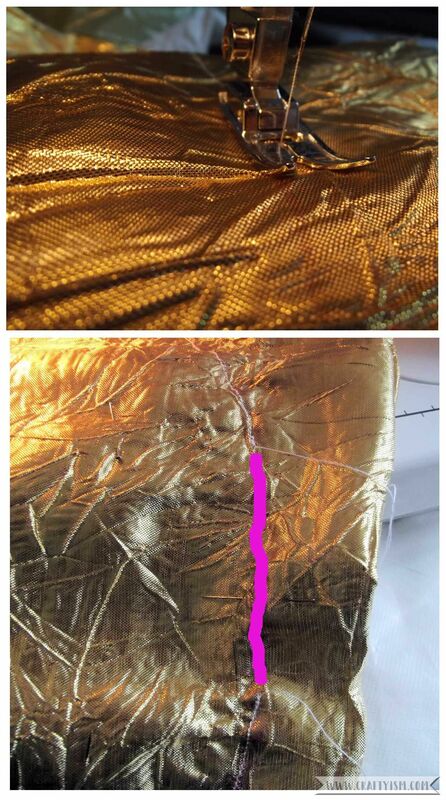 Fold the gold fabric in half right sides together, and using your fabric pen, draw a circle as large as you can on the fabric. You want a border of about 5 cm all the way around, so don’t go right up to the edges of the fabric. Pin it really well as the fabric will be slippery under the sewing machine. Sew around the circle you marked out, leaving a gap large enough to fit your hand into (see the pink line in the photo) so that you can add the stuffing later. Take your white fabric and fold it in half, right sides together. Fold it in half again. You should have four layers as in the top photo. 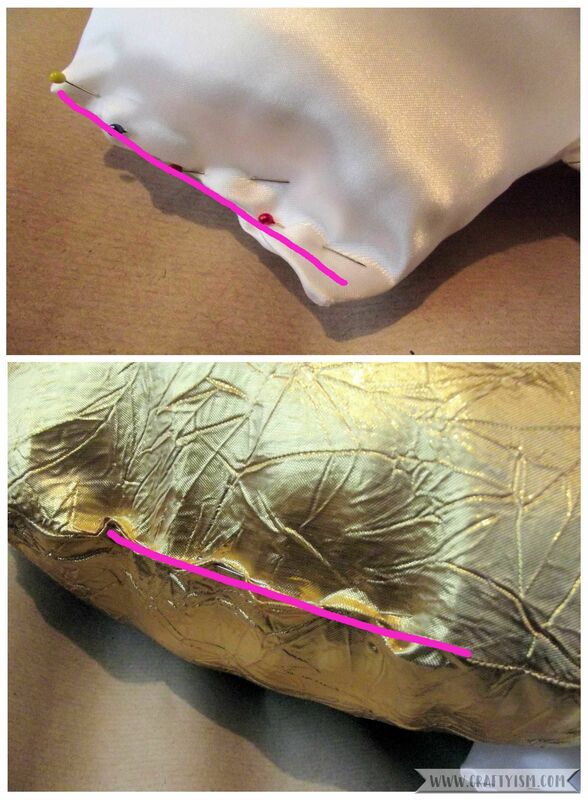 Using the size of your gold circle as a guide, draw a wing shape on the white fabric. You want the wing to be fairly long so that it will wrap around, with some shape to the bottom (see the photos above) Pin around the shape, then cut out, leaving a large border. 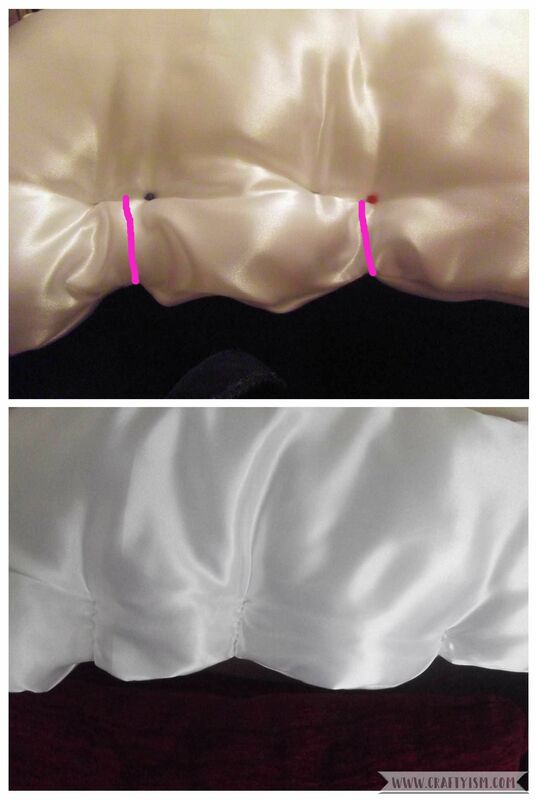 Un-pin, and separate, so that you have two wings, each with two pieces of fabric. You may need to re-draw the wing shape onto one of the wings if your fabric pen didn’t go through all the layers of fabric. Re-pin around the line. Turn the gold circle the right way out and fill it with the toy stuffing. You want it to be really well stuffed so that it becomes almost a ball shape. Turn the wings the right way out and stuff with the toy stuffing. The wings should be quite squishy and bendy, so don’t stuff them too much, just enough to give them some shape. Fold in the edges of the holes you left open for the stuffing and pin together (see the pink lines in the photos) Using the needle and thread, sew the holes closed using small stitches. 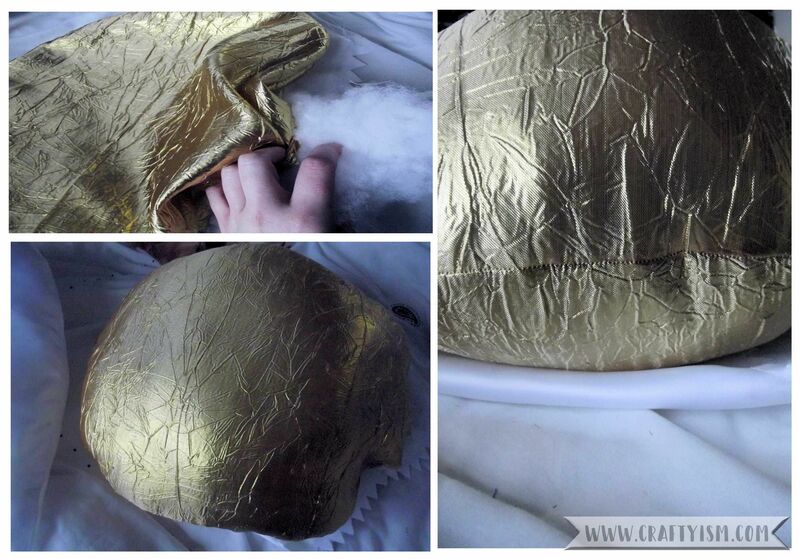 Lastly, sew the wings onto the gold ball. Pin one wing, a little above the middle of the gold ball, then pin the other wing on the opposite side to match. 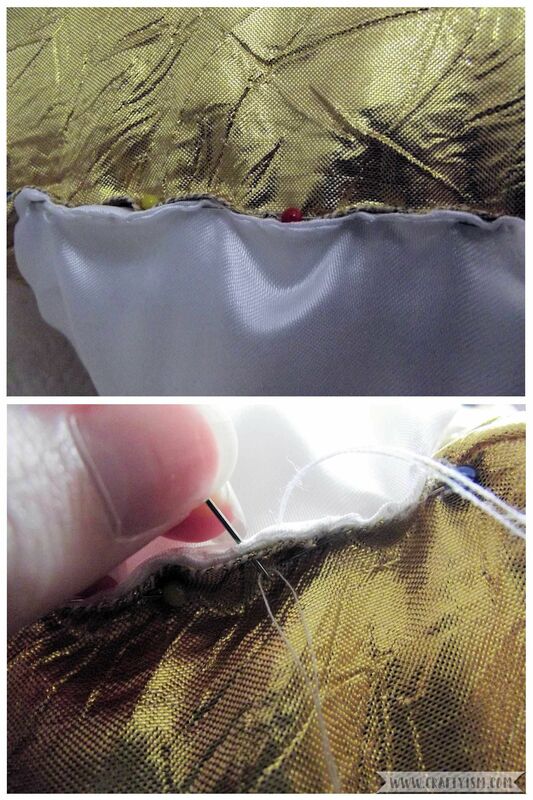 Using the needle and thread, loosely sew the very edge of the wing to the very edge of the gold ball. Now when you’re reading you will be kept company by your cuddly golden snitch! I hope you enjoyed this week of Harry Potter crafts. Let me know if you have had a go at any of them, or if you have any of your own that I could have a go at. Oh, and happy anniversary to J.K.Rowling and Harry!